“Somnium”, (“The Dream”), by mathematician and astronomer Johannes Kepler is one of the earliest known works of science fiction. In it, a narrator falls asleep and dreams that he reads a book in which with the help of a spirit teacher an old woman takes her son on a trip to the moon. 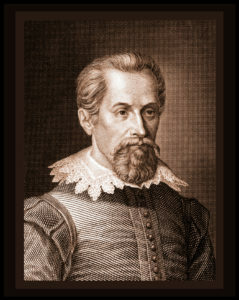 Some of the story’s elements were inspired by classical Greek writers Lucian and Plutarch, but Kepler’s purpose was much more astronomical than fictional. He was presenting some of his theories on space travel and lunar geography in a form which, he hoped, the religious and scientific authorities of the day would not find objectionable. He let the manuscript be read by colleagues he trusted, but in 1611 a copy got loose and was circulated through an unknown readership at a time when Europe was aflame with thousands of human torches, innocents burning at stakes before jeering mobs. Within four years fear and dogmatism had decided that the old woman of the story was Kepler’s hot-tempered old mother, and in 1615 she was arrested as a witch. For the next five years Kepler’s research was put aside while he spent time, heartbroken guilt, and money in saving his mother from being burnt at the stake. He finally obtained her freedom, but she died within two years, her health broken by her imprisonment. Kepler resumed his work, including expanding on Somnium with the addition of over 200 explanatory footnotes. He was past caring about the possible repercussions, and in 1630 had begun the process of publication when he unexpectedly died. Then his son-in-law, who carried on the project, also died. Kepler’s son finally brought it to publication in 1634. “Somnium” has never been widely available, and is not even now. We will present it slowly, translated from the Latin, paragraph by paragraph, incorporating the footnotes into the text where appropriate, with illustrations and commentary on the science, with respect to Kepler, and in the hope that someday soon humans will no longer burn each other to death. 1859 engraving by C.Barth; published in Meyers Konversations-Lexikon, Germany,1859.